How do these verses describe the Lord’s instruction? What about the Lord’s testimony? The Lord’s precepts? His command? What about the fear of Him, or His ordinances? Perfect. Renewing. Trustworthy. Right. Glad. Radiant. Pure. Forever. Reliable. Righteous. Scripture reveals God. So does creation. All we need to do is look around, search, and proclaim the truth of what we see and who He is. You might be the one to…step into the role, accept the position, complete the task. Yet you might not be the one. Why do you say yes or no to something? We build fences that keep us from walking the very ground God intends us to cover, because we’re too proud, arrogant, or ignorant to consider, acknowledge, and accept where God wants us to go. We tear down fences that are intended to keep us from walking the ground God doesn’t intend for us to cover, because we’re too proud, arrogant, or ignorant to consider, acknowledge, and accept where God wants us to remain. It’s God’s job to build and tear down fences, not ours. Anytime we do the building or tearing down, we should be cautioned to attend to where we are and where we should be. We think we should be able to decide where God wants or doesn’t want us to be. We even try to convince others we know where they should or shouldn’t be. If there’s a gap in what needs to get done, we think we know who should step up, because (1) someone has to step up or else it won’t get done, or (2) we see how the person and the task would perfectly fit together. Even if what we assume is consistent with God’s direction, we need to ask for his instruction first. Jumping in to provide a quick fix might seem to fix the problem, but if it’s not the way God wanted it to be fixed, another problem will soon follow. What seems to fit to us isn’t always God’s best fit. We can have God’s confirmation in less than a blink-of-an-eye…and when it doesn’t come that quickly, we’re wise to patiently wait. On the other hand, we can excuse ourselves from responding by saying we’re waiting on God’s instruction when we’re not fully committed to hearing God’s instruction. We’re fairly certain we’re not supposed to respond, but we’ll wait it out in case God says differently. 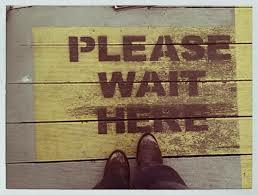 But are we actively waiting or passively waiting? There’s a difference. We always need to be active in our relationship with God, no matter where and at what pace he has us. What fences are you building or tearing down on your own, apart from God’s instruction? Whether you think you’re too good or not good enough to do something or whether you simply don’t recognize something that’s supposed to be on your radar, be cautious. Be sensitive to God’s leading. He wants you to walk every step of the territory he has purposed for you. Don’t explore where you shouldn’t be or place limits on where you should go. We don’t like to wait. We’re used to being able to Google just about anything we want to know. Whether we can trust the source or not has become a secondary concern to our quick access to information. If we “feel” something is right, we believe we have enough confirmation to move forward. Instead of asking, “What would God want from and for me in this situation?,” we more often ask, “Why wouldn’t God want this for me?” (if we ask anything about or from God at all). We expect direction on our own terms in our own timing instead of being willing to wait for the best terms and best timing. But waiting pays off. It’s not about the end result of getting the right answer and instruction, although that’s certainly important. It’s more about the process, the reliance on God, the trust we gain in building a relationship with Him. I can’t tell you the specifics. That’s part of the waiting process. But I can guarantee that if you’re willing to wait, you will “get” God. Watch for Him. Pay attention. Listen. He will always respond. …especially when we realized he trusted us enough to paint his creations. Sure, we were basically doing paint-by-numbers without the numbers. When we finished one job, he would grab a cup from his cart, pour in some base paint, then add a little of this color and a little of that to create just the shade he wanted. He’d point and say, “Here. Here. And here.” in his thick Russian accent to instruct us exactly where to paint, then walk away to help someone else. Every now and then, we’d catch him looking over our shoulders. We’d ask, “Okay?” He’d nod and smile and say, “Yes. Yes. Okay. Okay.” I wondered if he really meant it at times. He seemed to chuckle a little as he reassured us. But his affirmation encouraged us to continue to do our best. 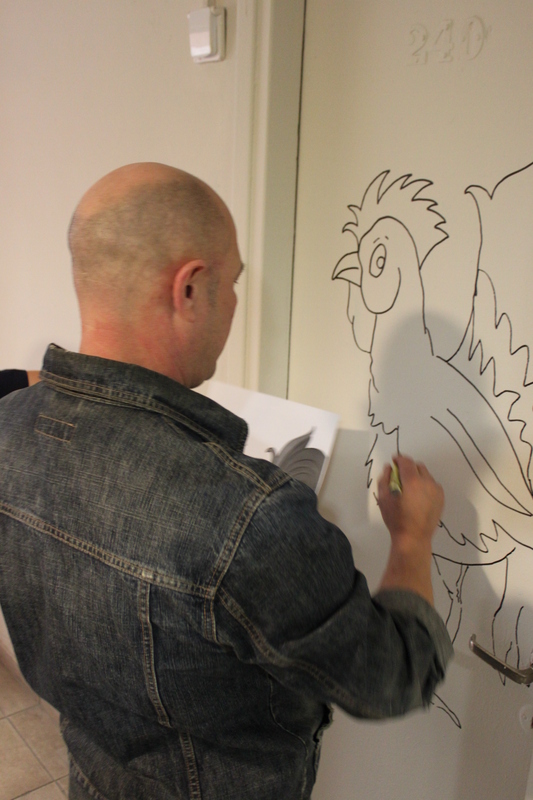 We were creating murals for the children and school staff, but we wanted to please the artist, too. It was his vision, and we wanted to bring it to life. Being trusted by an expert is flattering, but it also comes with responsibility. It reminds me of my relationship with God. I am flabbergasted by His love, mercy, and generosity. I find the responsibility of faith daunting and honoring. I get to participate in God’s plan. He creates the guidelines. He mixes the colors and gives me instructions, then He lets me respond. He’s never too far away. Sometimes I feel His closeness; sometimes I don’t, but I know He is always invested in my life. He created it. He corrects and encourages me. I may fill in just a little space of color, but there are people all around me who are adding their color. I may not be able to conceptualize the big picture, but I’m glad God can. And I’m glad He invites me to be a part of His world, His creation, His plan. I was taught to never let my gas tank get lower than the quarter tank mark. My dad preferred to have a half tank “just in case,” but he was adamant about the quarter tank. I’ve lived my life by that standard – until I got a vehicle with a warning system. A light comes on when my fuel is getting low and flashes when I need to get gas within the next several miles. The light has rarely come on – probably because of my dad’s firm instructions – but I’ve relied on the warning light several times, particularly when gas prices flunctuate. If I know I’ll soon be somewhere with consistently lower gas prices, I’ll intentionally let the fuel level get low so I can pack as much cheap(er) gas in the tank as possible. That was the situation when my daughter and I went to a nearby city to shop. The indicator light came on, and I pressed my odometer trip setting to begin measuring how many miles I could continue. The light wasn’t flashing yet; I could easily get to our next planned stop, which would be even closer to home. So, I rationalized, the “cheap” gas would take me farther. But while cruising on the interstate at 65 mph, the van died. I steered it to a safe location and got help…and learned some things in the process. How close to empty are you willing to go? Do your actions match your standards, or do you behave in a way that’s inconsistent to the standards you’ve been taught or that you teach others? Of course, I’m not talking about the fuel level in your vehicle. I’m referring to your spiritual fuel. How are you spiritually living? Where would your spiritual fuel gauge indicate you are right now? 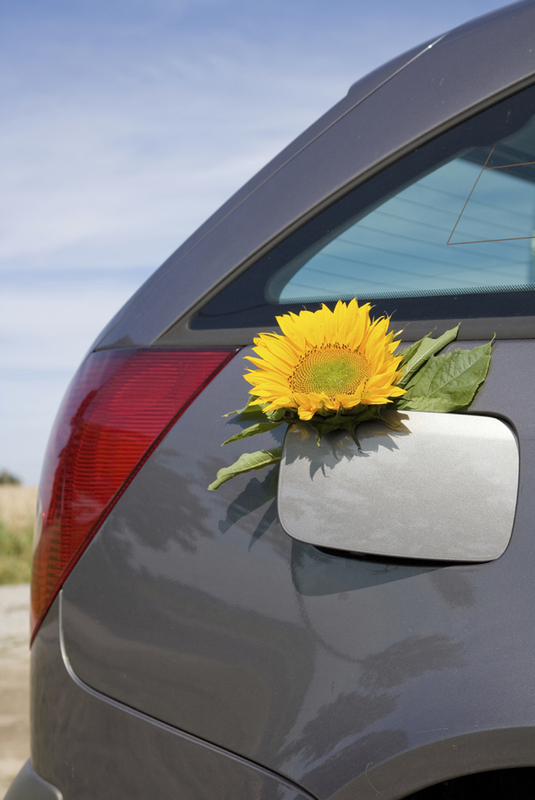 How often do you add fuel? What level of fuel do you consistently maintain? God doesn’t want you to try to stretch what you have just a little bit farther. God doesn’t want you to add only what you temporarily need. In fact, God doesn’t want you to determine the level you need or want at all. He wants you to rely on him for what you need. He knows better than you, because he knows what’s ahead. You might think you know, but your indicator lights are likely inaccurate because you don’t have all the information. God wants you to rely on him for what you want, too. He wants to be the one you want. As you trust God to provide, you’ll embrace his will, and because you most want his will – one bit at a time – you yield your will to his. When I rely on God, my standard for fuel is to always be full. When I rely on God, I’m only relying on his warning lights, which aren’t only to indicate “nearly empty” but also “not quite full.” And I don’t even need to watch the gas price wars to get the best deal! All I need to do is humbly submit to God, relying on him to provide and guide. I might run out of gas but through no fault of God. When I’m fully relying on him, I know where I’m going and have whatever it takes to get there. And I prefer the purposeful journey to sitting beside the road.